Does your cat have inflamed sores, blisters or ulcers around the mouth? Is your cat losing weight, showing signs of discomfort or pain and not wanting to eat? These symptoms are signs of feline rodent ulcers. Traditional veterinary treatment for feline rodent ulcers is the use of steroids and antibiotics which can provide short-term relief. Using these medications long-term can have side effects and reduced efficacy. The good news though is that holistic treatments can be used (diet changes and supplements) to help control symptoms, minimize flare-ups and change your cat's quality of life for the long-term! What Are Feline Rodent Ulcers? Feline Rodent Ulcers (also known has eosinophilic granuloma, feline eosinophilic granuloma, feline rodent ulcer, indolent ulcer, and eosinophilic granuloma ulcer of cats) is a non-contagious condition, unique to cats, where oral mucosal lesions develop. They can occur at any age but appear more often in female cats. In other words, open sores (similar to cold sores) appear, most often, on the upper lip of cats. Your veterinarian will typically diagnose rodent ulcers by the appearance and location of the ulcer (in questionable cases, a biopsy or needle aspirate cytology can be done to rule out malignant transformation). You might first notice a yellow or pink shiny spot, which deepens into a lesion. The sores can be very painful and hinder your cat's ability to eat. Their mouth might emit an unpleasant odor and over time, can become disfigured. 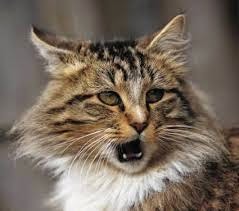 Your cat may also show a change in behavior (aggression or withdrawal). The conventional veterinary treatment for indolent ulcers almost always involves the use of steroids to calm the inflammation and antibiotics to clear up any secondary bacterial infection. While this may provide short-term relief, these medications can weaken your cat's immune system and cause side effects. Genetics, allergies and autoimmune disease are common reasons why cats may develop this condition and have it long-term. Thus the goal is to introduce holistic veterinary treatments to help support your cat's immune system and minimize the frequency of flare-ups. When your cat has an autoimmune condition such as feline rodent ulcers, your kitty's immune system is so overloaded that the cat's body forms antibodies to its own tissues and attacks itself. The onset of the attacks is associated with triggers such as food allergies, exposure to chemicals, vaccines and stress. Autoimmune conditions cannot be cured but they can be controlled. Holistic veterinary treatments, in conjunction with conventional treatments can minimize flare-ups and reduce the need for medications. Holistic treatments entail feeding your cat a hypoallergenic, anti-inflammatory diet and using supplements that modulate the immune system. Immune Harmony- this plant sterol formula is designed specifically for autoimmune diseases. It helps to modulate your cat's immune system and is very well-tolerated. Colostrum for Pets - very helpful for bad breath, gingivitis, autoimmune disease and gum diseases. Colostrum contains essential immune supportive ingredients helpful for stomatitis and feline rodent ulcers. Power Probiotic - essential for all cats, especially if your cat has been on antibiotics which kill off the friendly bacteria. Power Probiotic is the best probiotic for cats as it is pure, natural and there are absolutely NO fillers! Many cats love the taste and will eat the plain powder--please click on the link to see the video. Power Probiotic promotes the growth of friendly bacteria which ensure a healthy intestinal ecosystem and enhances overall immunity. QuentaSAN - this powerful anti-viral formula is used in conjunction with NotaSAN drops. QuentaSAN and NotaSAN are your best line of defense against viruses, infections and a weakened immune system. These homeopathic, gentle drops are easy to administer and start helping your cat right away. NotaSAN - a best seller for fighting infections, use NotaSAN in conjunction with QuentaSAN drops to give your cat immune support to overcome feline rodent ulcers. These homeopathic drops are used on alternating nights with the QuentaSAN. Changing your cat's diet to a hypoallergenic, anti-inflammatory diet along with using supplements to modulate the immune system can can make a dramatic improvement in your cat's quality of life and comfort. Many foods such as dry kibble can not only be painful to eat but may also contain ingredients that worsen the syndrome and increase flare-ups. If you include your cat's diet and symptoms on the order form at checkout, AskAriel.com will include a diet suggestion on the packing slip that comes with the product directions. Need help with your cat? Email the professional staff at support@askariel.com. You will receive a prompt response, but please note that veterinary advice cannot be provided.